To most, the title “Pacific Ocean Paintings” would conjure the Impressionist seascapes hanging in local galleries by the hundreds. Marcia Hafif has a different take on sea, sand, sky and the life sustained by them. She has interpreted what she has seen on her walks along the shore into seemingly monochromatic canvasses that run the gamut from pale crimson to a turquoise hued green to pale blues. “I first painted the series in 2000 after I returned to Laguna Beach. I became inspired by the colors of the sand when the sea retreated and the reflection of the sky in the wet sand,” said Hafif, who divides her year between Laguna Beach and New York. The Laguna Art Museum will unveil “Marcia Hafif: From the Inventory,” an exhibit of her drawings and paintings organized in several groups, such as “Red Paintings,” “Pacific Ocean Paintings,” “Double Glaze Paintings,” and “Shade Paintings,” among others on Sunday, June 28. Born in 1929, Hafif spent a large part of her childhood in Laguna Beach and in 1999 established a studio here. Still, although her work is well known on the East Coast and acclaimed in Europe, particularly in Italy, Switzerland and Germany, she has received relatively little recognition here, said museum Executive Director Malcolm Warner, who curated the show and helped with an accompanying book by the same title covering her works made since 1972. “Since her body of work is vast by now, we are concentrating on works that she made in Laguna Beach,” he said. She exhibited some of her “Glaze Paintings” in 2003 at the Peter Blake Gallery. Many have tried but intrinsically failed to find a label for Hafif’s minimalist, seemingly monochromatic work. “Marcia Hafif seems to belong to an international group of monochromatic painters, but the term is really inaccurate. They appear that way seen from a distance, but closer examination reveals combinations of color and a quest of trying to capture the essence of painting,” said Warner. For example, a seemingly gray painting titled “Neutral Mix” contains the colors viridian, alizarin crimson and cadmium red. When asked about marketing a minimalist show to a public more accustomed to plein-air and representational art, Warner said Hafif interprets the landscape and ocean in an abstracted, philosophical manner but still in line with prevalent California art, such as previously exhibited works by John McLaughlin. “Marcia creates an aesthetic anyone can appreciate. When paintings are put together in as careful an arrangement as she makes, they create a beautiful, calm and pure experience for viewers,” said Warner, who said his role as curator was appropriately minimal, merely serving as a liaison between the artist and the museum and assisting with the book. Also on view from the museum’s permanent collection, a Richards Ruben painting from his 1959 Claremont series. “Ruben was a mentor to Marcia. He showed her the way out of realism and liberated her from the notion that art has to describe something,” said Warner. Hafif traces the beginnings of her painterly journey to her Laguna childhood. “As a child I was fascinated by the painters working here. But I soon found that the actual paint and what it did interested me more than a finished picture,” she recalled. “Today painting is something I do for myself; I want to see what the paint looks like,” she said. 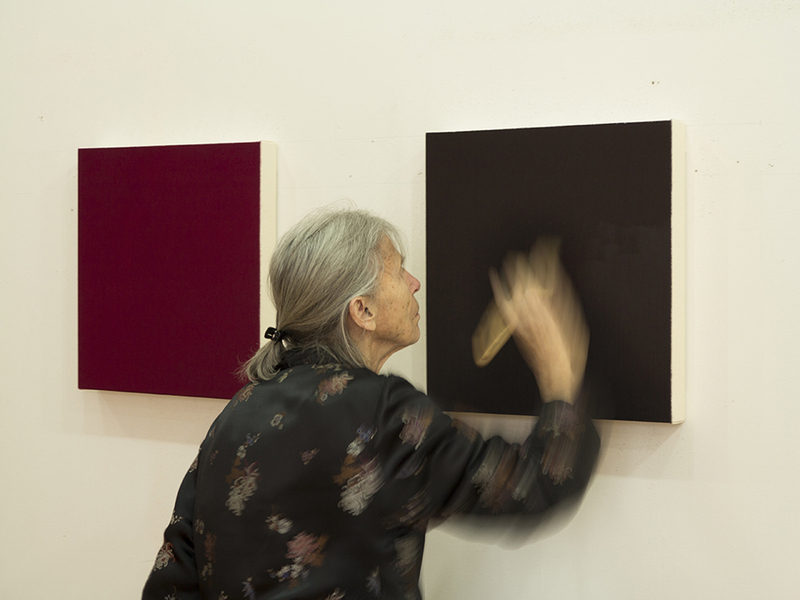 “Today, I can sum up my work as a conceptual study of pigment and paint materials,” she added. The “Inventory” contains studies in mediums like watercolor, oil paint, acrylic paint and egg tempera. Then again she experiments with glazes, letting a base color shine through several layers of differently colored glazes. The “Shade Paintings” tell another story altogether. Here she added black to primary colors along with also producing a series of black paintings that clearly reveal her immersion in the process of painting, an outgrowth of earlier, post-grad school drawing. Note that the black paintings are not purely black but contain shades of blue and burnt umber with a variety of brushstrokes creating illusions of layers. She began to draw, making irregular marks on a variety of paper to ease herself back into painting after a dry period. A small side exhibit in the museum’s mezzanine also shows photographs taken by Hafif while in graduate school at UC Irvine. Marks become highly prevalent again in her series of “Broken Paintings,” works with similar but more highly discernible brushstrokes in color combinations of, say, cadmium orange and ultramarine blue. The result is a subtle gray, purple and greenish composition. In addition, bright lighting and a lack of didactic labeling will give viewers free range to interpret the works for themselves in myriad ways. “Installation is important to me. In a certain way I make the paintings not as individuals and how they relate to a wall space or a museum, but want them to speak to each other,” she said.